At V&H café we aim to source the best local artisan suppliers. In our view, the best dishes are celebrations of the seasons finest ingredients, supplied by the most knowledgeable, skilled and passionate masters of their trade. Westdene Butchers in Westdene (funnily enough) is our champion butchery for meat of every description and all round service in Sussex. Owner, Trevor Morton personally delivers his produce to his customers and is extremely generous with his expertise and knowledge. He even invited me out for a day butchering a couple of deer, shot by one of his local hunters. We travelled to the hunters’ house, nestled into a small valley surrounded by ancient oak and weeping willows. Armed with two butchers’ blocks, knives and a saw, we set up outside the Sussex barn, serenaded by a chalk river trickling in the background and got to work. The surroundings encompassed the very nature and habitat that the animal came from and seemed as fitting a place as any to prepare it for the table. One-on-one tuition really does reveal a lot about the tutor. His reverence and respect for the animal, the zero tolerance for wastage and swift efficiency with very few tools was a real pleasure to be a part of. He is a true old-school master of butchery and one of those “worst kept secrets” among the top end eateries in Sussex. 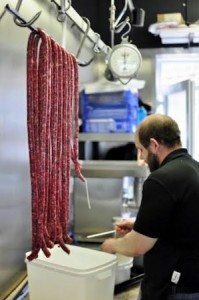 He supplies the café with free range and gluten free sausages, free range chicken, black pudding, biltong, Droëwors, legs of gammon and anything else we can find of his to adorn our specials board throughout the seasons. 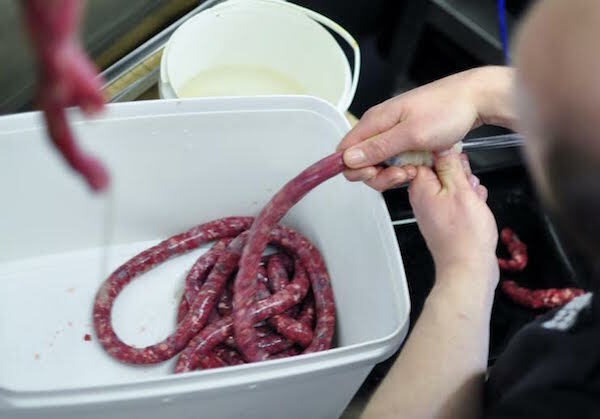 This time we’re making venison Droëwors; a Southern African derived snack based on a traditional Boëwors sausage but dried and cured to form a delicious jerky-like style sausage. They are very popular at the café as a lunchbox filler or post lunch man-snack (also a cracking accompaniment to a Sussex ale!). Large chunks of Sussex venison shoulder and neck are seasoned with special curing salts and spices, including ground coriander seed, salt, pepper and Trevor’s personal touch, nutmeg. 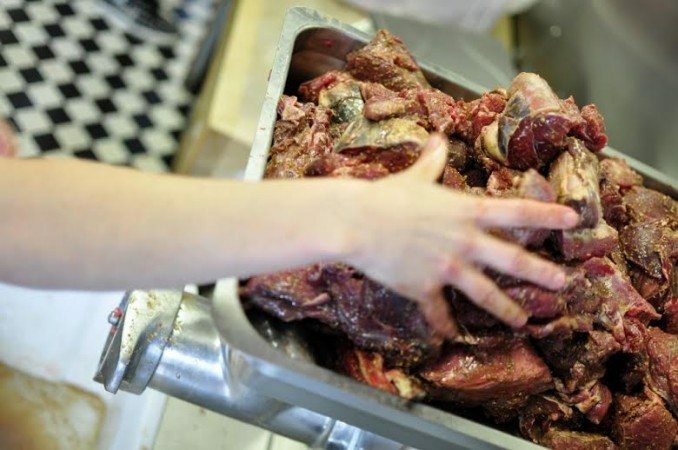 These chunks are then massaged to take on flavour and extract moisture from the meat. Vinegar is then added to aid the preservation process, preventing bacterial build up or mould. After the meat is suitably seasoned it is then turned into a coarse mince traditionally associated with a Droëwors or Boërewors sausage. 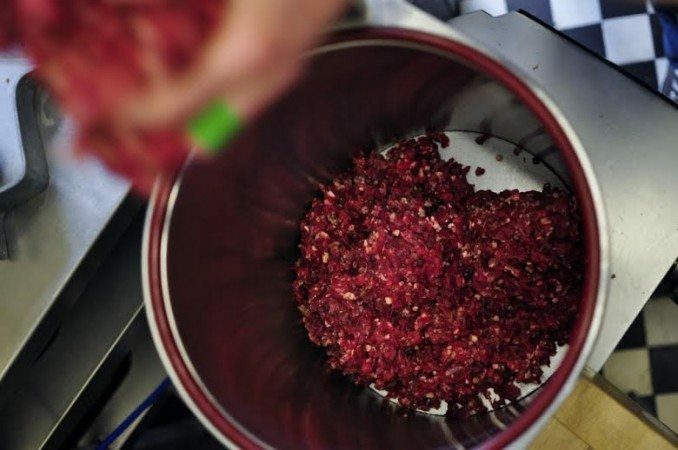 The mince is given a final mix by hand to ensure all of the spices are evenly distributed. 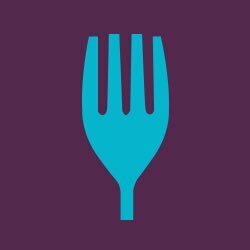 Venison meat has a far richer and deeper colour in comparison to pork, lamb or beef, creating an intensely dark red mince which looks incredibly decadent! Coarse mince traditionally associated with a Droëwors or Boërewors sausage. Once the 10 meter long sausage is tied off it is hung out on stainless steel bars, ready for the dryer. It’s a fantastic and charming site seeing these long snaking sausages hanging from butcher’s hooks, when in this day and age we only see our meat presented in polystyrene packets from the supermarket. 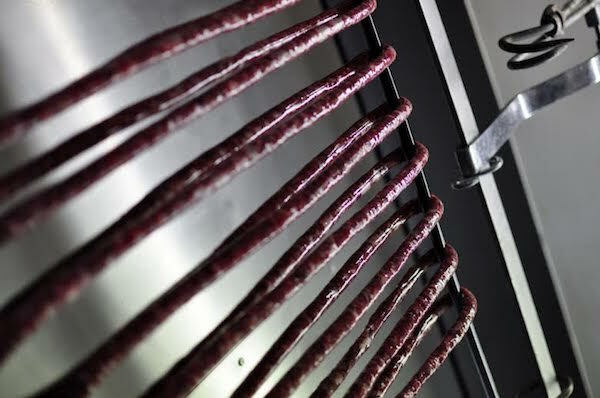 The Droëwors are then placed into special climate controlled dryers that circulate dry air at preselected temperatures, recreating the climate in which biltong and Droëwors would first have been cured in – Dry, warm savannah air, hung off a tree away from opportunist predators (Like me…). After 48 hours, at 30 degrees Celsius exactly the Droëwors are ready to be hung out to cool. They have turned rigid, the skins have shrunk and the smell when we opened the submarine like doors of the dryers was wonderful. Their flavour is distinctly gamey and the spices add a lovely subtle depth. They’re not jaw achingly chewy in the slightest, but have an almost gentle crumbly crunch to them. These South African specialties should come with a health warning… HIGHLY ADDICTIVE! Many thanks to Trevor, Kim and Robbie for putting up with me for the day. 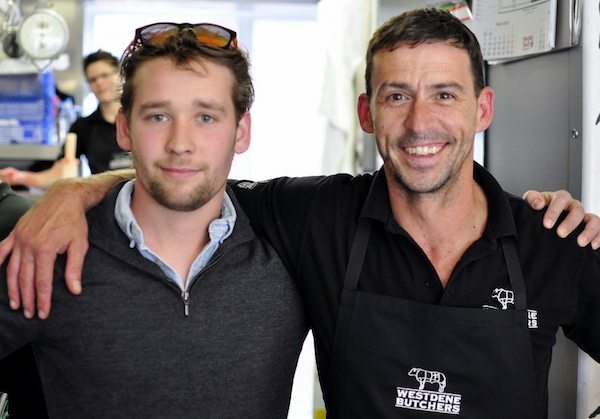 We would recommend Westdene Butchers to anyone who takes their meat seriously and has a flair for food as these guys do. Keep up to date with V&H Café’s favourite local artisan suppliers and look out for more blog posts in the coming months.